Niagara Falls, NY - Grace McKenzie, outreach supervisor with Catholic Charities, gives Sammantha Hollis of the Town of Niagara information about the organization as part of the 3rd Annual Project Connect Niagara at Heart, Love, and Soul Food Pantry & Dining Room. Project Connect Niagara, is explained as an event designed to connect those in need with critical services in a “one-stop” venue. NIAGARA FALLS, N.Y. – Project Connect Niagara, an event designed to connect those in need with critical services in a “one-stop” venue, will take place on Wednesday, July 25 from 9 a.m. to 1:30 p.m. at Heart, Love, and Soul Food Pantry & Dining Room in Niagara Falls, N.Y.
Last year’s event saw approximately 315 attendees, each of which whom able to connect with more than 40 organizations that were represented. 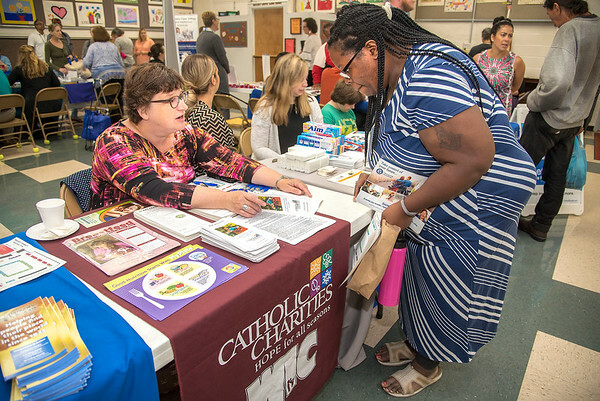 Those attending were able to access free services and resources including housing, employment, government benefits, Veterans’ benefits, and legal services. Also on hand was Mount St. Mary’s Hospital, offering several free medical services. Transportation was provided from local communities to the event. The event is presented by the Niagara County Coalition of Services to the Homeless, in conjunction with the Annual Niagara County Poverty Conference. With a goal of making a positive impact on the community, the Project aims to form a partnership between community volunteers, city government, non-profits, and the private sector to provide this "one-stop shop" of health and human services for those in need throughout Niagara County. Agencies interested in participating in Project Connect Niagara should visit http://www.niagara.edu/projectconnect and complete the form as space is limited. For additional information about the event, please call 716.205.0287 or email projectconnectniagara@gmail.com.